From June 2nd to 7th, I attended the International Astronomical Union (IAU) symposium in Victoria, British Columbia titled “Exploring the Formation and Evolution of Planetary Systems”. The symposium brought together astronomers from all over the world to connect our ideas about planet formation with the exoplanets that have been discovered. The result was a great conference consisting of 53 talks and even more posters, plus countless opportunities to network and collaborate with others in the field. In this post, I’ll give a brief recap of conference. I certainly don’t have time to summarize every single talk, but for those who are interested, all the talks are available for viewing here. 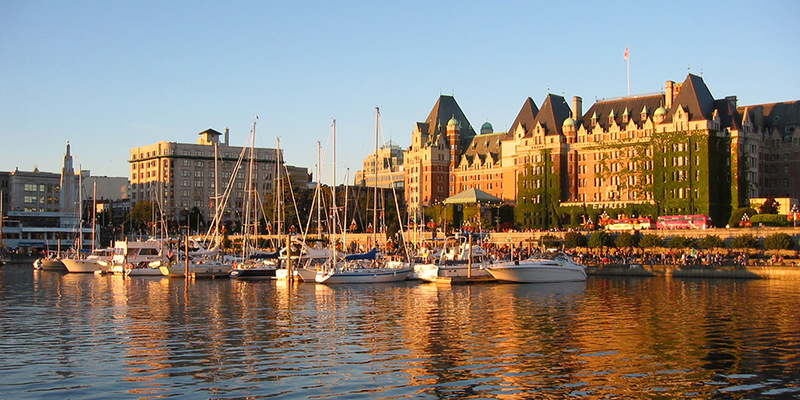 The inner harbor in Victoria, British Columbia. The largest contingent of planet hunters at this conference was focused on direct imaging. Unlike the radial velocity, transit, or microlensing techniques, direct imaging involves actually seeing the planets themselves. This is difficult because a planet is a very faint object that is near a very bright object (the star it orbits), and only a handful of planets have been imaged so far. Direct imaging requires large telescopes with sophisticated instruments, and there are several direct imaging teams around the world building this technology and using it to carry out planet searches. Beth Biller gave a great overview of this field, followed by updates from some of these teams, including talks by Arthur Vigan who presented results from a survey conducted with the Very Large Telescope (VLT); Motohide Tamura of the SEEDS (Strategic Explorations of Exoplanets and Disks with Subaru) team; Brendan Bowler who is using the Subaru telescope to search for planets around low-mass stars; and Raphael Galicher from the International Deep Planet Survey (the team that imaged the first giant planets around the star HR8799) who is putting together a database where all direct imaging teams can share their findings. A notable discovery was the lowest mass planet yet imaged (4-5 Jupiter-masses, as already reported in this astrobite). Also, the SEEDS team teased the discovery of a 3 Jupiter-mass planet, although they were not yet ready to reveal details. Even when planets are not found, these surveys place important limits on the masses and orbital locations of planets, which informs our understanding of the planet formation process (see, for example, this astrobite). Although prominent, direct imaging wasn’t the only game in town. Chris Tinney talked about the status of the RV (Doppler) planet detection method, focusing on the Anglo-Australian Planet Search (AAPS). They now have a 15 year time baseline, allowing for the discovery of relatively long-period planets. Once exoplanets are discovered, we want to determine their properties. Transiting planets reveal their size, which, when combined with a mass measurement from radial velocity observations, yields the planet’s average density — a clue to its composition. A planet’s atmosphere can be characterized by studying the starlight that passes through the atmosphere when the planet transits in front of the star (transmission spectroscopy), or by analyzing the emission from a directly imaged planet. See these eight astrobite posts for some examples. Jonathan Fortney gave a great review of planet characterization, highlighting the large diversity of compositions discovered so far, which means we need a large sample of characterized planets before we can draw general conclusions about their formation. Raphaelle Haywood was able to get simultaneous RV and transit observations of the exoplanet CoRoT-7, which allowed her to successfully characterize it by accounting for the effects of the star’s active surface on the data. Joe Llama gave an excellent talk explaining how asymmetric features in the transit light curve of WASP-12 can be explained from the shock of the stellar wind on the planet, which then tells us about the planet’s magnetic field. Jay Farihi observed polluted white dwarfs, where the pollution comes from asteroids that crashed into the white dwarf and were destroyed. By observing this pollution, he could characterize the composition of asteroids — the same material that forms planets. There were two talks characterizing the planet Beta Pic b with direct imaging data. Mickael Bonnefoy showed measurements of the light from the planet at several near-IR wavelengths, allowing him to draw some conclusions about the planet’s temperature, atmosphere, and formation history. Katie Morzinski also presented observations from the visible through the near-IR using two cameras and the adaptive optics system on the Magellan telescope (“MagAO“). We can also learn about planet properties by characterizing them as a population. Leslie Rodgers performed a statistical analysis of Kepler planets with determined masses, and she found that planets larger than two Earth-radii are unlikely to be rocky. Ralph Pudritz showed that the population of detected planets can be reproduced if planets form in “traps” in the protoplanetary disk. Rebekah Dawson explained how hot Jupiters get on their small orbits by both scattering with other planets and smoothly migrating inwards through the protoplanetary disk (see this astrobite for more info). Yanqin Wu examined the low-mass close-in planets from Kepler and determined that their densities can be explained if they all formed roughly the same, but some lost their atmospheres due to x-ray radiation from their star. Young stars are surrounded by protoplanetary disks composed of gas and dust. Planets form in these disks, so studying their structure, composition, and evolution is vital to understanding planet formation. Protoplanetary disks can be observed at wavelengths from the near-infrared to the radio, which probe different sizes of dust particles and different regions of the disk. Gas in the disk can be observed from emission lines. Sean Andrews gave a nice talk describing what can be learned about disks from observations in the sub-mm and radio wavelength regimes, especially with ALMA; Catherine Espaillat presented her observations of disks in the infrared to sub-mm with Spitzer and Herschel; and Chunhua Qi showed how to observe the CO snow-line in disks (the location where CO transitions from gas to solid), which plays an important role in planet formation. The SEEDS team also presented a number of disks imaged in the near-IR showing interesting and diverse structures. Observing disks in the visible and near-IR can be difficult because the central star is very bright at these wavelengths, but Gaspard Duchene (filling in for Karl Stapelfeldt) talked about how this problem can be avoided by observing disks that we happen to be viewing edge-on so that the disk blocks out the star. He showed several newly-observed edge-on disks with the Hubble Space Telescope, which allowed their vertical structure to be measured. An interesting subset of protoplanetary disks called “transition disks” show large inner cavities, which might be caused by the inside-out dissipation of the disk or by an orbiting planet. Richard Alexander reviewed how planets form in constantly evolving disks, and Jonathan Menu gave a talk on the popular transition disk, TW Hydrae. Nienke van der Marel described how the dust, the gas, and a planet can interact to create an asymmetric dust trap (a region where solid material collects and can coalesce into larger objects), and she showed ALMA observations of a transition disk where this may be occurring (the details are in this paper). Finally, Michael Ireland presented updated observations of the planet that may be forming in the cavity of the LkCa15 transition disk (originally reported in this astrobite); he now sees the object’s orbital motion. On the theoretical side, Aake Nordlund showed simulations of protoplanetary disk formation using adaptive mesh refinement, which allowed the model to span nine orders of magnitude in scale — from 50 pc in giant molecular clouds where stars form, down to 0.01 AU to resolve the thickness of the protoplanetary disk. See these two astrobites for more on adaptive mesh codes. Roman Rafikov provided an excellent overview of our current understanding of how planets form in disks. Eugene Chiang discussed various theoretical mechanisms by which dust in protoplanetary disks can collapse to form planetesimals — the first stage of planet formation. Michiel Lambrechts showed how giant planet cores can form more efficiently if they are built directly from small cm-size “pebbles” rather than the typically-assumed km-size “planetesimals”. Finally, Ana-Maria Piso took a detailed look at the final stage of giant planet formation, the accretion of gas from the protoplanetary disk onto the planet core. A debris disk is what remains in orbit around a star after the gas of the protoplanetary disk has dissipated and giant planets have formed. The solid particles comprising debris disks range in size from km-size planetesimals to micron-sized dust, which can be observed by the visible/near-IR light that it reflects from its central star or by its thermal emission at longer wavelengths. Mark Wyatt gave a nice overview why debris disks are exciting — that they may trace out the location of planets in the system. Kate Su followed up on this idea, showing several well-studied examples of planets shaping the debris in their system and arguing that multiple planets are needed in each system to create the debris disks architecture that we see (for more info, see this astrobite). Grant Kennedy studied the prevalence of warm dust with WISE. This dust is in the terrestrial zone of its planetary system, analogous to the Zodiacal dust in the Solar System, so it is often referred to as “exo-Zodi” dust. The emission from exo-Zodi could be brighter than the light from a planet in the region — a potential problem for future direct imaging planet searches (see this paper for details). Jonathan P. Marshall presented the results of the Herschel Dust around Nearby Stars (DUNES) survey, which, at far-IR and sub-mm wavelengths is sensitive to cold disks. They found that 20% of stars have debris disks (a higher fraction than previously thought), and many disks were extended enough to be spatially resolved with Herschel, allowing their true sizes to be determined. T.J. Rodigas showed beautifully resolved images of debris disks observed with the Large Binocular Telescope and Magellan in the near-IR. The resolution of such observations are only possible with powerful adaptive optics systems. 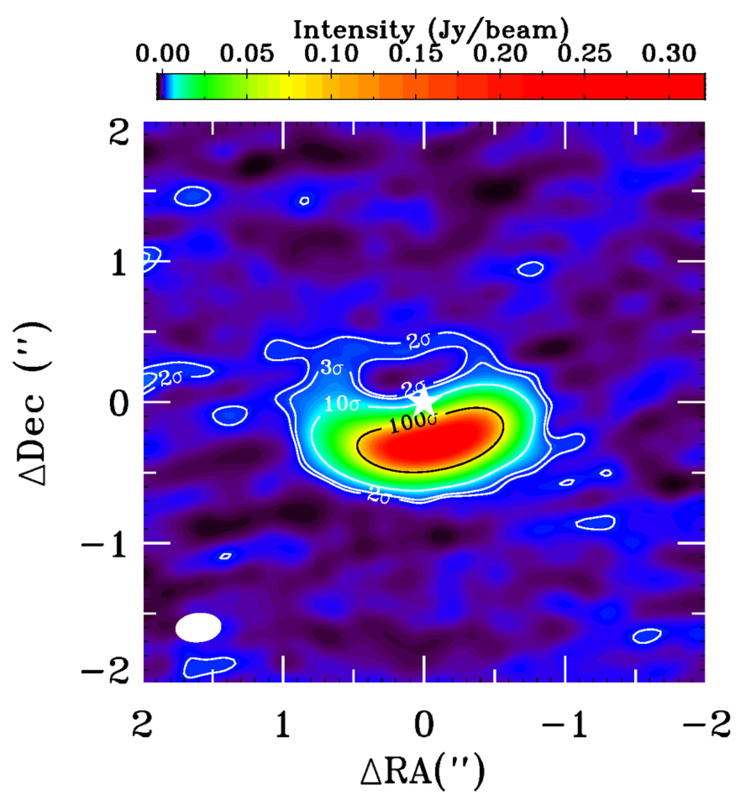 Meredith MacGregor presented her observations of the famous debris disk around AU Mic at radio wavelengths with the SMA and ALMA (for details, see these astrobites). 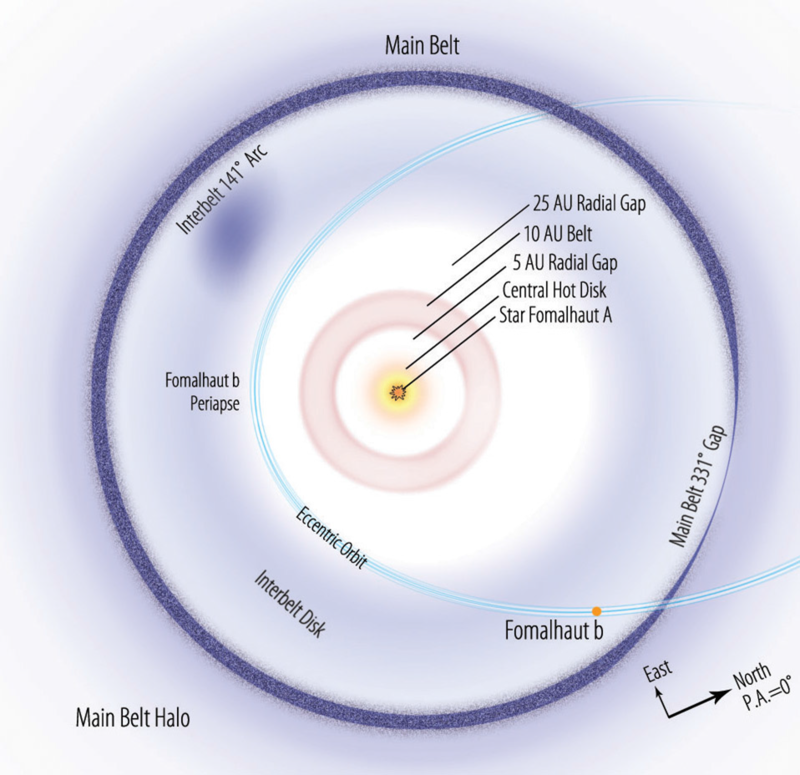 Paul Kalas presented updated observations of Fomalhaut b and confirmed that the object is real and on an eccentric (e=0.8) orbit heading toward the system’s cold debris belt (see the paper here). Finally, Samantha Lawler gave a very interesting talk on our own cold debris disk: the Kuiper Belt. She observed many individual Kuiper Belt objects, characterized their orbits, and put them into an n-body simulation to see the Kuiper Belt’s dynamical properties. As you can see, even in the small slice of astronomy dealing with planet formation and detection, there is a lot to talk about! Stay tuned to Astrobites to see all the latest news from this field and from all areas of astronomy. Nick, that was an awesome review of what sounds like a fantastic conference. Thanks!